In my last article about Good Refrigerators for a Garage, I talked about the two “camps” that people looking for garage-ready refrigerators fall into. The first camp (people who want a fridge that will operate properly in the extreme temperatures of an uninsulated garage) turned out to be the most popular, and readers have been asking me to list MORE refrigerators for garage use ever since. In keeping with the spirit of listing “3 Good Ones”, I thought that, instead of just listing 3 more good garage-ready refrigerators for this article, I would list 3 Categories of refrigerators that are good for a garage. This way, you'll have three solid strategies for conducting your own search. 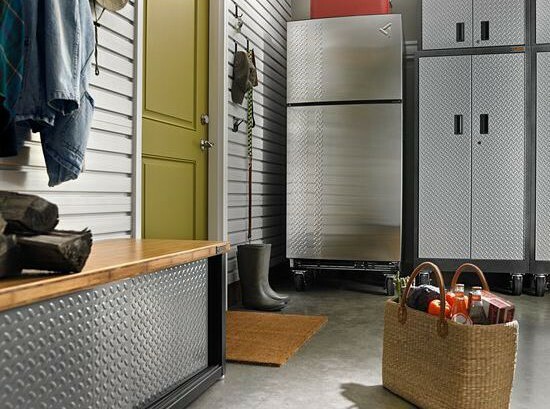 For each category, I'll explain the conditions in which it works best, and why you might want to go with one of these refrigerators for your garage. Then, I'll list a few good options you might consider purchasing. If the inside of your garage will fall or rise to temperatures outside of that range, that is when your problems can begin. Garage too hot? The compressor can get overworked and break down. The insulation might be insufficient to keep your food cold. For climates where your garage can get significantly hotter than 105°F, there are a few models that are built to withstand the heat. Hotter than 110/115°F, and you might need to start looking at outdoor refrigerators—which are usually smaller, and may not suit your storage needs. Or, you'll need to find ways to cool your garage, or to insulate it and your fridge from the excessive heat. Garage too cold? Your thermostat can get “confused” and your frozen food might thaw, or your refrigerated food might freeze. Maybe the fluid that works with your compressor will get too cold to flow properly, resulting in mechanical problems. In climates where the temperature of your garage can drop to freezing temperatures, you can actually have MORE problems by simply putting a standard refrigerator freezer in it. I know, it's counter-intuitive. You'd think that something designed to keep things cold would work fine in a cold environment! Refrigerator-freezer typically work by “freezing the air” in the freezer section, then using some of that cold air to cool the refrigerator section. The compressor system that keeps that freezer cold is usually controlled by a single thermostat that monitors the temperature of the refrigerator section, keeping the fridge at about 38-40ºF. When the temperature of the garage goes below that ideal range for the fridge, the thermostat doesn't bother to turn on the compressor, because it's already cold enough. No compressor action means that the freezer will begin to warm up, and its contents will thaw. If the garage gets even colder—below freezing—then the contents of the refrigerator will begin to freeze. Part of the solution to the cold-garage problem is two thermostats: One for the fridge; One for the freezer. Other solutions are to remove the need for two thermostats by buying a refrigerator-only unit, or a freezer-only unit. That's how I came to the 3 categories of refrigerators and freezers listed in the rest of this article. The manual should tell you the optimal operating temperature range—often in the Installation section. *Always check the the installation instructions (usually available online) about the ideal temperature range for your unit before purchasing it. I have found that many of the “garage-ready” refrigerator freezers are not properly insulated from freezing temperatures in the refrigerator section, or require a garage refrigerator kit for the compressor to function properly. Now that we've gotten past all that explanation, let's look at some options. One way around the need for two thermostats is to get rid of one of the sections. Let's start with the freezer. 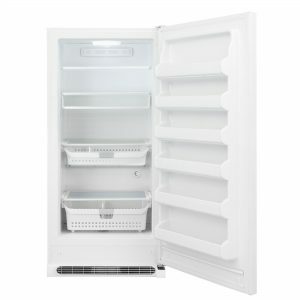 Aside from having to compensate for the dual freezing/refrigerating functions with separate thermostats, full size freezerless refrigerators have another advantage over the standard refrigerator-freezer combo: No freezer also means more space for storing items you simply want refrigerated, and not frozen. Usually, with garage refrigerator-freezers, most of the unit is for refrigerating anyway, so you probably won't miss the freezer section. On the other hand, if you do more freezing than refrigerating, check out the Standalone Freezers section, below. 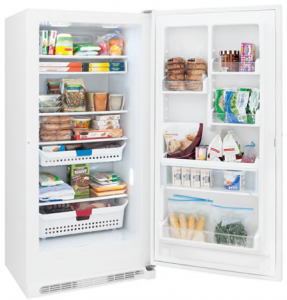 *In my updates, I often keep one or two convertible refrigerator freezers on this list. I could easily list them under Standalone Freezers, but I want to highlight them here for being highly suitable as refrigerators for a freezing cold garage. “Gallery” is Frigidaire's high-end appliance line, so these will be a little on the expensive side, but the additional features and appearance are usually worth the additional expense. I'll let you click those links above to dive deeper into those features. 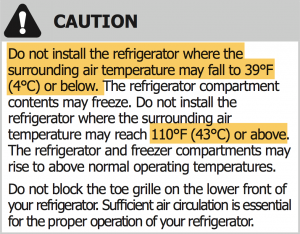 According to the manual for this Frigidaire convertible refrigerator freezer, temperatures below freezing (32°F/0°C) will NOT affect compressor and freezer operation. So, additional garage kits or compressor heaters are not recommended. 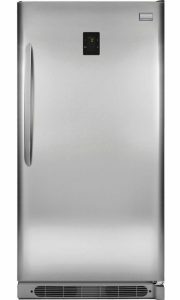 When set to refrigerator mode, Frigidaire's “Freeze Control Feature” will maintain the proper temperature inside the fridge, “even when the refrigerator is placed in an area where the surrounding temperature drops to 10°F (-12°C).” This will keep your perishables from freezing and being ruined. And, the extra-thick insulation that protects the refrigerator items from freezing will also keep everything cold for over 2 days if you ever suffer a power outage. I like how the height and position of all the shelves, drawers, and door bins can be adjusted to fit your particular storage needs. LED lighting brightens the whole interior when open. “Frost Free” fridge freezers defrost automatically, but should still be cleaned on occasion. *EXTRA $50 off a Kenmore Appliance of $499+ with code KENMORE50 at checkout . 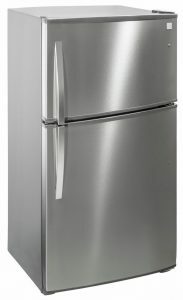 Remove the stainless steel surface, the sleek digital thermostat, and one or two other “flashy” features, and you have a slightly less flamboyant convertible freezer-refrigerator than Frigidaire's “Gallery” model, above. One large 20.2 cu. ft. compartment convertible to refrigerator. Operates in temperatures below freezing (as low as 0°F/-18°C). When in refrigerator mode, an automatic Freeze Control Feature will maintain the proper interior temperature so as not to freeze your food, even when the surrounding temperature drops to as low as 10°F (-12°C). “Adapt-n-Store” adjustable shelves and drawers/baskets in the main section to fit your particular storage needs. LED lighting brightens the whole interior when open. This fridge freezer's “Frost Free”—no need to defrost. Another Frigidaire. Except the Frigidaire Freezerless Refrigerator FFRU17B2QW is “all refrigerator” (no freezer functionality). Also called a “single door refrigerator”, it stands as a slightly smaller and more practical version of its bigger and sexier cousins above. And, more affordable. At 16.7 cu. ft., it also boasts Frigidaire's “Freeze Control Feature” maintaining proper refrigerator temperature inside, even when the the surrounding temperature is as low as 10°F (-12°C). Like the one above, that'll keep your fruits and veggies protected from freezing in a pretty darn cold garage. Other standard features include adjustable wire shelves, bright interior lighting, and frost free defrost. Click the shopping links above for more details. The other way around the need for two thermostats is to get rid of the refrigerator section. Clearly ideal for long-term storage of meat and frozen goods. Since food in your freezer is kept at 0°F (-18°C) and below, it's more likely that freezer-only units will be designed to work in freezing—and sometimes even sub-zero—environments. *You should still check the owners installation manual to be sure that the operating range of the unit is ideal for the temperature range in your particular garage. Especially if you live in a warmer climate, reaching high temperatures. 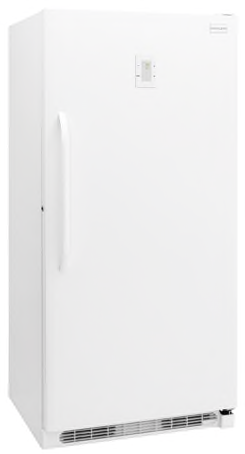 Kenmore's compact chest freezer stands about 32″ high, with a capacity of 8.8 cu. ft. The upper limit of its operating temperature range is the standard 110°F. Temperatures of 32°F (0°C) and below will NOT affect freezer operation. Additional compressor heaters are not recommended. Sears' Kenmore compact chest freezer also comes in black. Moveable/removable wire basket sits at the top for fingertip convenience in storing smaller items. This compact chest freezer also comes in Black as the Kenmore 12909. 3 lift-out, sliding bulk storage baskets offer easy access and flexibility. 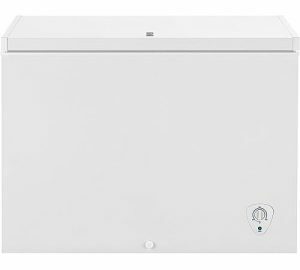 Check out the Home Depot listing or the GE Appliances site for this chest freezer: reviews in the hundreds reveal a high level of satisfaction, and answer a lot of questions about the capacity and use of this small chest freezer. At 14.8 Cu. 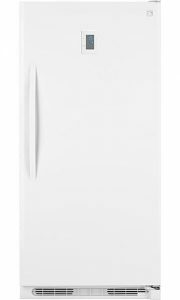 Ft., the Frigidaire Chest Freezer FFFC15M4TW falls smack in the middle of the Medium size category. Temperatures of 32°F (0°C) and below will NOT affect operation. Additional compressor heaters are not recommended. Safety Lock with pop-out key automatically ejects the key after locking, so you don't leave your key behind. The power light on the outside lets you know the unit is running, and an exterior dial for temperature control makes for ease of reach and operation. 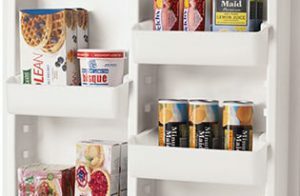 The convenience of these over the Chest Freezers is that the shelving and door bins make it easier to organize food and access it without bending over or moving items or digging around too much. *EXTRA $50 off a Kenmore Appliance of $499+ with code KENMORE50 at checkout at Sears.com . 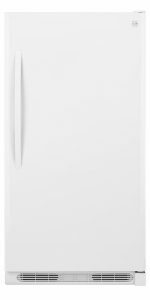 Kenmore Elite 27003 Upright Freezer is an upscale, classy Stainless Steel, large (20.5 cu. ft.) capacity appliance with a number of bells and whistles that make it a highly useful and convenient multi-purpose freezer. 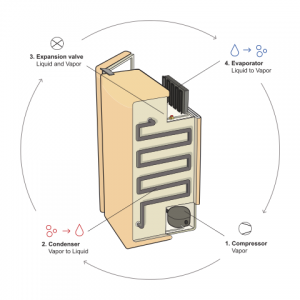 … the unit should be located where surrounding temperatures will not exceed 110°F (43°C). Temperatures of 32°F (0°C) and below will NOT affect operation. Additional compressor heaters are not recommended. Frost-Free design saves the effort of chipping away at icy build up. 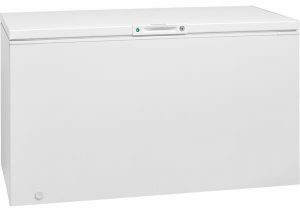 I found the Frigidaire Upright Freezer FFFH21F6QW, which turned out to offer even more features than its predecessor (albeit at about $70 more). … the appliance should be located where surrounding temperatures will not exceed 110°F (43°C). Temperatures of 32°F (0°C) and below will NOT affect operation. Additional compressor heaters are not recommended. Power-On Indicator Light so you'll know at a glance that your freezer is working. Lock With Pop-Out Key automatically ejects the key so you don't accidentally leave it in the door. 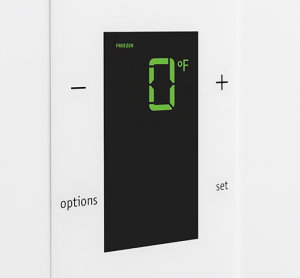 Digital Control Panel on the door allows you to see and set alarms and modes, such as “Quick Freeze” mode and “Sabbath Mode”. While there are a number of options out there that claim to be “garage ready,” they generally do not work as well in what I would call “extreme” cold. Typical temperature ranges for what manufacturers consider a garage refrigerator freezer are 50°~105°F. Most people coming to this page are looking for something to work in much colder (or hotter) environments. Frigidaire was my first introduction to garage-ready refrigerator freezer combinations, as well as the refrigerator garage kits that allow them to run at lower temperatures. If your unit is in a garage or area where the temperature is below 55°F, adjust the freezer control to the coldest setting to improve performance. NOTE: Sustained exposure to ambient temperatures below 39°F will likely result in freezing of food and beverages stored in the refrigeration section. So, you can count on the freezer section to handle extreme cold for an extended period. This unit has a 18 cu. ft. total capacity, 2 “SpillSafe” glass shelves, and crisper drawers. 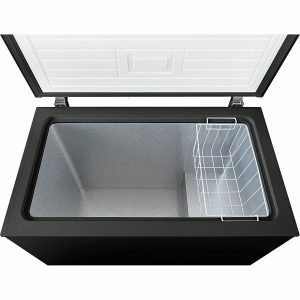 Its freezer capacity is 3.9 cu. ft. with automatic defrost. This would be a good option if your winters tend to be “mild” or your garage slightly insulated. But you might not want to store non-freezable perishables in the refrigerator section if you're having a particularly harsh winter. NOTE: Sustained exposure to ambient temperatures below 39°F (4°C) may result in freezing of food and beverages stored in the refrigeration section. Its 21 cu. ft. capacity gives ample storage space, with a split shelf system and a deli drawer to provide more ways to organize your storage. 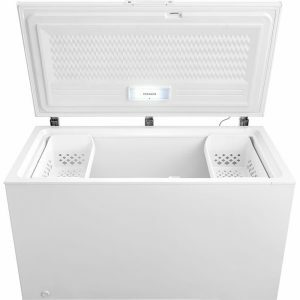 LED lighting and a Frost-free freezer allow for easy maintenance. Determining which is the best refrigerator for a garage is clearly a matter of identifying your personal situation: your storage needs, the temperature and climate, insulation in your garage, etc. Finding a fridge that actually fits your parameters is the next difficult step. For example, in Google, you might combine words describing the appliance and the temperature range, then add the PDF filetype to be sure it looks through PDF manuals, and then the manufacturers's site or the shopping site URL. What you type will take some trial and error, but the effort can result in options you might not have found nor considered before. I hope that these three overall strategies, and the many options that I listed above, will give you a good start towards finding the best garage-ready refrigerators (or freezers) for your storage needs. If you have any questions, or even suggestions for other refrigerators for garage use, please add them to the comments below. I look forward to hearing from you. Hi, thank you for your informative article. 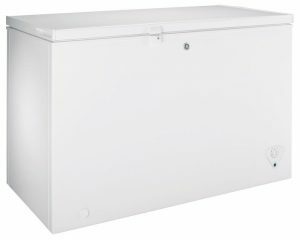 Is there a Summit freezer and a refrigerator that you would recommend for a garage in a midwest home? 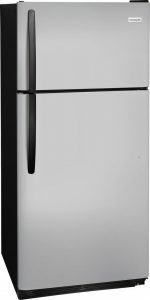 FYI, I learned today that Gladiator Garageworks has recently released a full size freezer (137324) and a full size refrigerator (137317) in matte black. It’s made by Whirlpool & is 30 7/8 W x 72 1/4 H x 32 3/8 D ( depth includes a foot pedal for hands free door opening). Did you read my original article about Good Refrigerators for a Garage? In it, I mention the Summit FF1511SS, mainly because it can operate at temperatures as low as 23ºF. I know that it can get even colder in the Midwest, depending on the state, but that is a pretty good performance for a garage refrigerator. It’s available at Home Depot, and Appliances Connection, as well as others. And, YES! 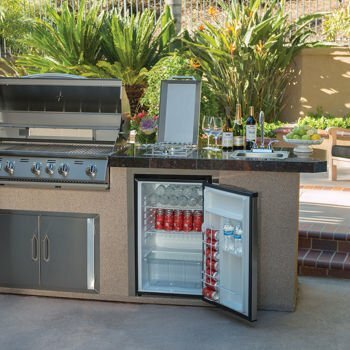 I have heard about the new refrigerator and freezer from Gladiator Garageworks. I plan on updating that original page later this summer, and will be considering adding them to that list. They may even warrant their own individual review. Stay tuned! And, thanks for commenting! how about buying a fridge/freezer for an uninsulated garage and unplugging it and not using it in the winter? will that hurt the unit in any way? No, I don’t think that will cause any damage to the unit. As long as it’s protected from the elements, and (if it’s been in extreme cold for an extended period) you give it time to reach a satisfactory operating temperature before plugging it in again. I was looking for a freezer for my mountain cabin which can get cold when we’re not there. I called a couple of vendors. What I was told was that the government has required a supposedly more ecological coolant. The coolant they came up with has caused the recent problem of freezers not staying cold enough in cold rooms. The new mandated coolant gums up at lower temperatures So refrig/freezers which worked well anywhere for generations now are basically unsatisfactory except inside a heated house. I can’t believe there isn’t some kind of coolant they could develop that eould work like before and still be ecological. We’re in a technological age after all. Thanks for all the information. I live in the Northeast so winters are cold and summers are hot. 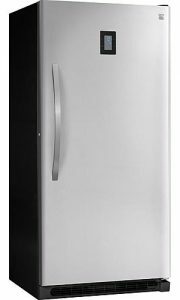 I was looking at standalone freezers, specifically the Frigidaire Upright Freezer FFFH21F4QW you reviewed and really liked the price and everything. I noticed it was discontinued and replaced with Model # FFFH20F2QW. I was looking at the manual but had trouble finding the information I needed. Is this freezer essentially the same as the discontinued freezer? Thanks for the heads-up on the discontinued model! Sorry to take a while to get back to you. I hope you were able to use the information and suggestions on this page to determine the answer for yourself. Still, I looked up the details about replacements to see what I could find. 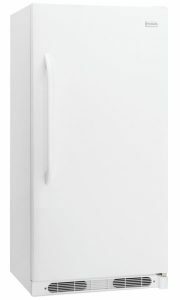 Looking at the model you mentioned, Frigidaire’s Model# FFFH20F2QW that Home Depot offers as a replacement, I see that it has the same temperature resistant specs — no hotter than 110°F, and temperatures of 32°F and below will NOT affect operation (listed under the “Location” section on page 4 of the manual). However, it’s missing the flexibility of the adjustable drawers and shelves. There are no drawers, and the door shelving is fixed. The same goes for the Frigidaire model# FFFU21M1QW offered by Appliances Connection. Same temp specs, with adjustable shelves, but no drawers, and fixed door shelving. I found it! 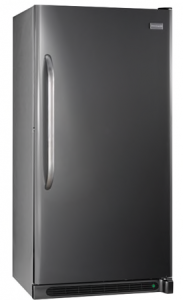 I’ve updated the post to review the Frigidaire FFFH21F6QW – Click here to check it out! Just wanted to share that it seems Gladiator is back in the garage refrigerator game. They have two models, an all refrigerator and an all freezer. Both can withstand temperatures between 0°F and 110°F. However, they admit that cold temperatures can cause fridge contents to freeze, since the fridge is not equipped with a heater. This is in contrast to the Frigidaire refrigerators you listed in this article which have the “Freezer Control Feature” which will maintain internal temperatures down to 10°F. I don’t think these refrigerators have a heater either, so I don’t know if this feature can even work. Still, it’s nice that these Gladiator refrigerators can operate at such low temperatures, since most refrigerators these days are only designed to survive at 55°F and higher.